A roaming musician, teller of tales, and sometime adventurer, this bard finds his living on the road and at the wayside in the inns and towns which dot the landscape of Eriador. Though the life of a bard is not an easy one, he finds what respite he can in spinning tales and music to enchant the minds of his audience. Tales of old or newly-spun tunes, dirges or merry jigs, he has a repertoire that encompasses all that he seen in life, and the experience of many years on the road. The Tower of Orthanc raid set has many unique cosmetics, and from the moment I saw the Shoulders of Thelin I loved them! However, the other parts of the set I always felt were more suited to a human minstrel, rather than elves. This outfit takes the understated classy look of the Isengard head and shoulder pieces and pairs it with a black tunic and cloak with gold and bronze accents. The bard lives to serve his music and his audiences, and with that in mind I have put together a more subtle but elegant outfit, one which stands out but does not draw undue attention away from the performer’s music – perfect for that of a wandering minstrel and tale-teller. 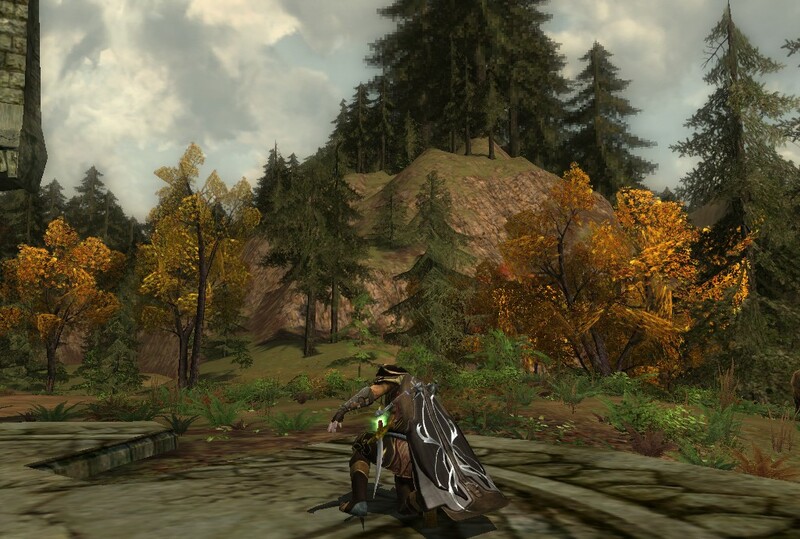 One thing I love about LOTRO is the feeling of discovery and the many beautiful places in Middle-Earth one finds along the road, a feeling Frodo and Bilbo both must have had in mind while singing their well-known walking-song. The beautiful open world that exists in-game is there for the exploration and discovery of so many, and I am glad such lovely landscapes exist around every bend in the road ahead. 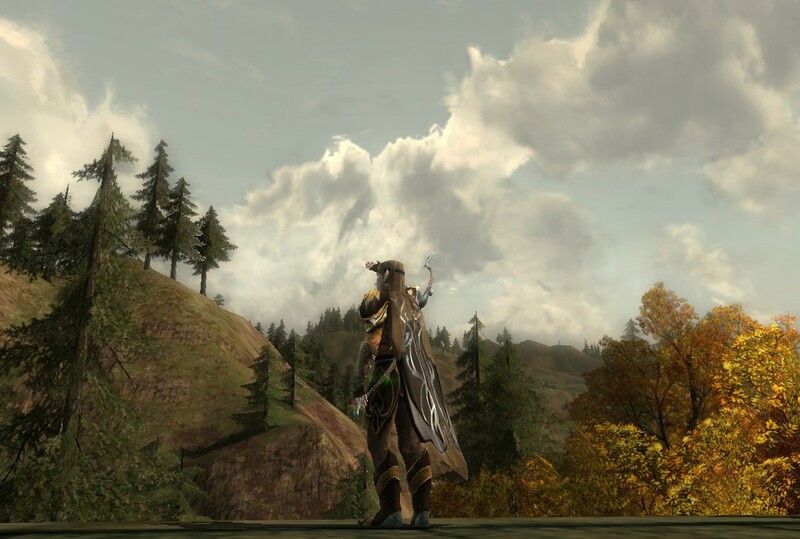 I remember the first time I came across the beautiful hill of Dol Baran in the Gap of Rohan, when questing in Dunland. I was simply blown away by the fields of purple flowers stretching as far as the eye can see! The geography of Dol Baran only makes the view all the more gorgeous, with the blue sky arching overhead, surrounded by the distant grey shadows of mountains. I have always wanted to make an outfit inspired by this beautiful corner of Middle-Earth, and finally put together one for my Captain. I dyed the shoulders Rose to echo the dusky color of the flowers and the swirls on the dress, and the dyeable bit of the headdress is Violet, which curiously matches the bodice of the dress better than Indigo.The dress was tricky to dye, as the body of the dress has an underlying greyish color that changes any shade applied to it, but I think this Indigo color manages quite nicely. The purple swirls on the dress already match the flowers, so I wanted a background that was a bit darker and more muted, allowing the purple swirls to really shine – similar how the deep blue of the sky overhead provides a welcome contrast to the seemingly never-ending fields of flowers! I’m back, after a few months’ hiatus, and quite enjoying the lovely spring (practically summer) weather in my corner of the world. 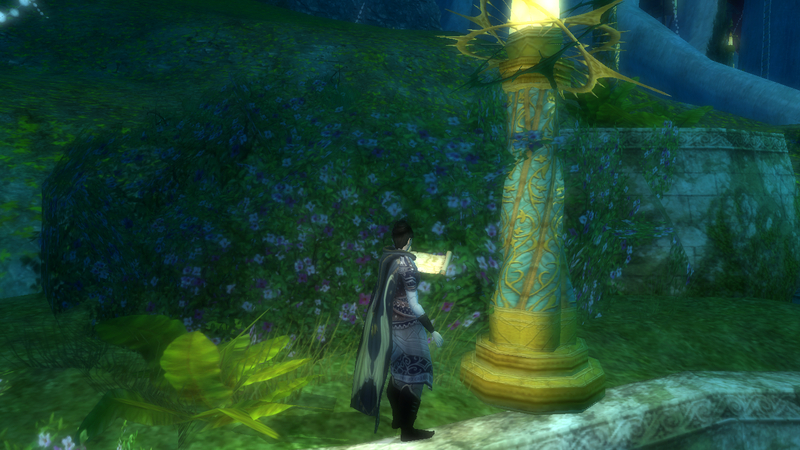 And in Middle-earth, flowers seem to be springing up left and right as well! The Spring Festival is in full swing, running until the 21st of June, and sports a bright new steed, FOUR new cosmetic dyes, and some other cosmetics. 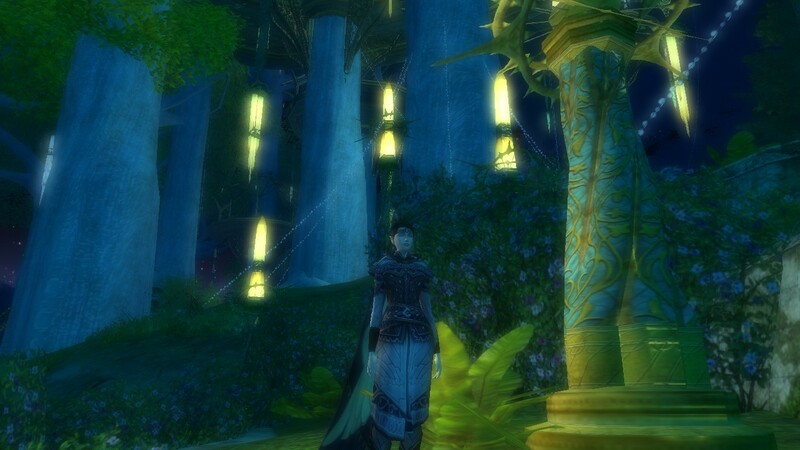 There are lovely previews of those rewards available on Gloredh’s blog, Wandering Around Arda! Logging in to Bullroarer, after I had updated the client, I was not disappointed. The elven lands around Celondim are particularly stunning, and many-colored flowers bloom all over the previously sparse fields. I specially loved the inclusion of the tall lupine-like wildflowers from Rohan in shades of purple and teal, and the reed-like grasses by the water. The Falathlorn homesteads are likewise newly covered in flowers and blooming beautifully! Here are some screenshot previews of what the next update will bring to the landscape of Eriador. In celebration of this season of flowers, I am planning a few floral and summer themed outfits, which I hope you will enjoy! Over lands broken by Ages of tumult. 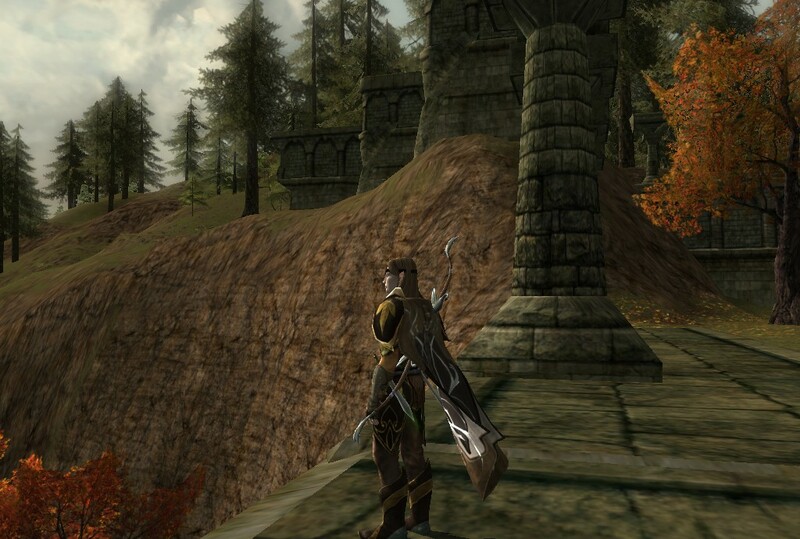 This outfit all began from a staff I acquired while doing the Volume I epic quest in Forochel. The wing design, adorned with a blue gem, inspired me to match it with an outfit. The staff is not unique, as I could have sworn I saw the same cosmetic skin on a staff of level 45-50 which might have been a quest reward in Angmar, but I do not have any further information unfortunately. As of Update 16.2, weapons can be equipped cosmetically, making it more fun to mix and match outfits and staves on my Lore-Master. The Elf-Queen’s dress dyes in a unique shade, always significantly lighter than the base dye, and has a beautiful sheen to it. The wing motif on the staff is echoed in the Swan-Cloak, and more subtly in the white and silver detailing of the shoulders. The shoulders I used in this outfit are from the level 75 minstrel set, barterable (class-restricted) in the Ox-Clan Camp, but the appearance of the shoulders is the same for the Lore-master and Rune-keeper sets. Dressed in shades of brown and umber, this archer blends in with the autumnal landscape of the wooded lands surrounding Imladris. His garments are crafted of intricately tooled leather, though dyed in an unassuming color. At either side of his belt, a dagger hangs at the ready, and another is tucked into his gauntlet. Swift, silent, and watchful, he is the the eyes and ears of Imladris, keeping watch over the hidden valley, the home of those he loves. I have always loved the understated but elegant tooled-leather look of the Lothlorien guild crafted armor, and knew that I had to make an outfit with them for my hunter. The chest, legs, and boots in this outfit are lookalikes from some of the Moria medium armor class sets, and there is also a barterable cosmetic version available at the skirmish camp vendor. When the Summer Festival of 2015 rolled along, I was pleasantly surprised by the lovely Cloak of Nárië which was among the new rewards. The pattern and unique shape of the cloak suggested something which might fit with this outfit, and I am quite happy with the result. The center dyeable part of the cloak has a rather strange tint to it, and so I tried to match the rest of the outfit as best as I could. I first saw these shoulders in the lovely Elven Flowers outfit from the cosmeticlotro blog, but the link was to an outdated item which was obsolete after the level cap was raised to 85. Luckily, I was able to find a lookalike, which is either the hunter shoulders from the Dar Narbugund raid set, or the hunter shoulders bartered from the class trainer in Ost Galadh. Chest: August Coat of the Golden Wood, dyed Walnut Brown – T6 Tailor Crafted Lothlorien Guild Recipe, OR Ceremonial Jacket of the Shield-Wall – Skirmish Camp Cosmetic Vendor (Moria Medium Armor), OR Trapsetter’s Jacket – Moria hunter trainer. Note: The Moria class sets for other medium-armor classes should have similar looking pieces to the chest/legs/shoulders in this outfit. An elf walks below the golden boughs in the half-light of Lothlórien, with a quiet and thoughtful expression on her brow. 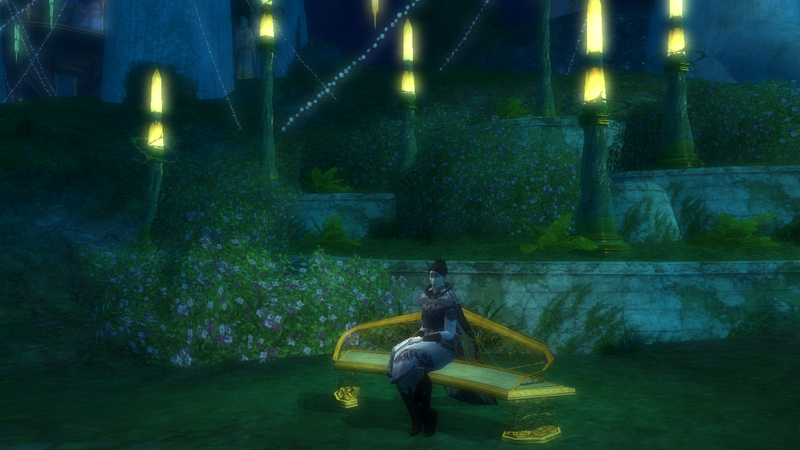 She stops to meditate by one of the many crystal lamps which light the deepening twilight, and begins to write. Her robe is short, and suited for wandering outside among the grasses and flowers of the Golden Wood. With parchment and pen ready at her side, she is ready to capture any thoughts which may occur to her in a moment of inspiration, beneath the star-crowned branches of the Mallorn trees. This outfit was inspired by the gorgeous Robe of Faramir’s Faithful which became available with Update 16. It is unfortunately not easily acquired, as it must be bartered with Morgul Crests, which drop from T2 instances in the East Gondor Osgiliath cluster. As of Update 17, Roving Threats in all areas of Eriador and Gondor also have a chance (albeit a small one) of dropping Morgul Crests. I built the rest of the outfit around this robe, which has a unique texture and very elven-looking embroidery which reminds me of stars in the twilight sky. 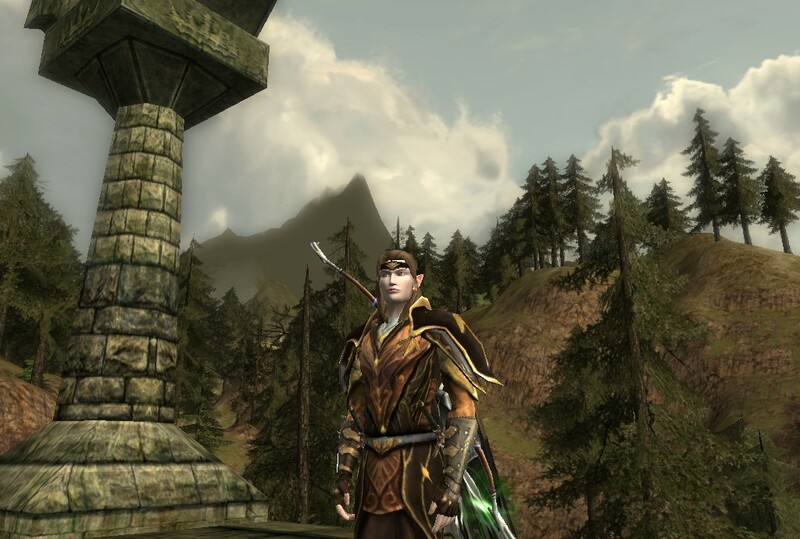 Undyed, all the Faramir’s Faithful items have a unique color which is slightly darker than the Steel Blue dye color available ingame, and complements the star motifs and white areas of the robe perfectly. The feather-like motifs on the Shoulders of Faramir’s Faithful are echoed in the Cloak of the Ibis, one of my favorite store-exclusive cloaks ingame. Steel blue dye works perfectly with the twilight hues of Lothlórien, after the sun has set and the stars are beginning to appear in the sky.